Set of fully ADA compliant tactile restroom signs with braille. 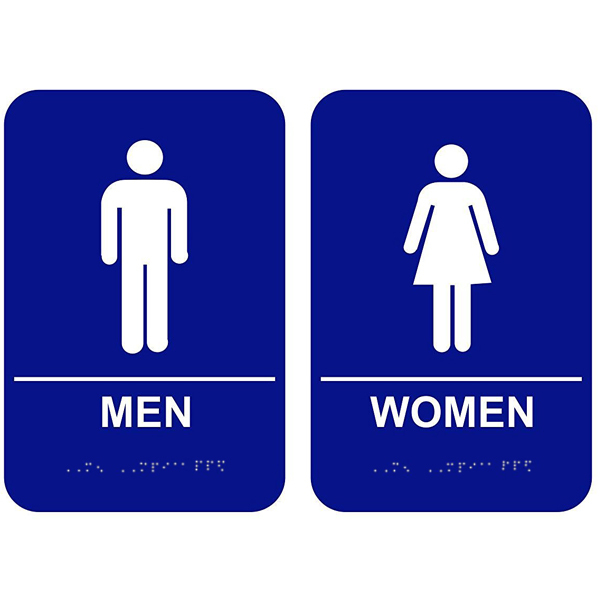 Bathroom signs measure 6" x 9" with rounded corners and adhesive backing. This set of fully ADA compliant tactile restroom signs with braille is a staple in any building that provides access to restrooms. Clearly show directions for patrons with this set of white on blue signs with tactile lettering. Each includes text, pictogram and braille dots to assist visually impaired patrons. These bathroom signs measure 6" x 9" with rounded corners and adhesive backing. CustomSigns.com offers a full line of ADA restroom signs.